It’s the perfect time to pick Elderflower (so I’ve been told!) This is my first experience of foraging, and I had such a buzz from making something that I’d found (for free! ), picked and brewed. I’m also SURE that drinking it has helped my hayfever this year. A deliciously refreshing drink that’s so easy to make, lasts for ages and is great in a Gin and Tonic as well as on it’s own. Remember that this is a cordial and so will need to have lots of water added to it before drinking – sparkling water turns it in to a grown up refereshing non-alcoholic summer drink. 3. 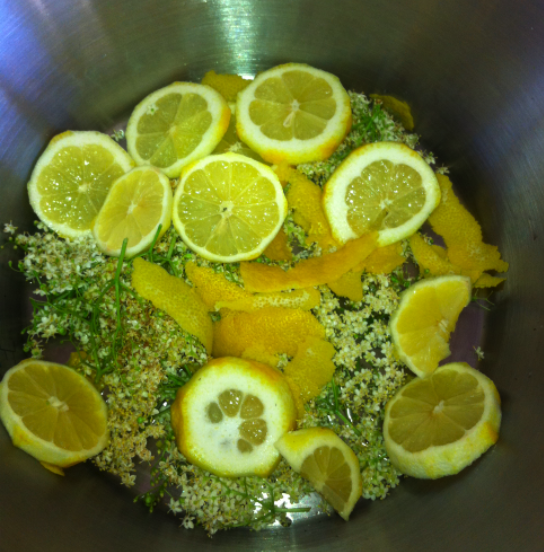 Using a potato peeler, remove strips of zest from the lemons and add these to a large bowl or clean bucket, along with the elderflower heads. If you’re in the States, and looking for something to do on July 30th, why not pop along to ‘Carrabba’s’? They will be hosting mixer events at each of it’s restaurants to raise money for the Muscular Distrophy Association. The cost per person is just $15 which includes a sampling of new Carrabba’s appetizers and one of three signature drinks created by Charlotte Voisey, one of the nation’s top 12 mixologists. Proceeds from the event will benefit MDA. Combine ingredients and shake well. Serve in a martini glass.